The new Mega TRI 60 from American DJ is long on brightness . . . in more ways than one. The new Mega TRI 60 from American DJ is long on brightness . . . in more ways than one. 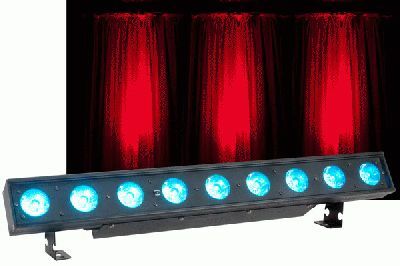 First, this linear LED color-mixing bar emits an incredibly brilliant output, powered by 9 ultra-bright Tri-Color (red, green, blue) 3-watt LEDs. Second, the Mega TRI 60 is “long” in literal sense, measuring a full 2 feet/.6 meter, making it ideal for covering walls, stages, dance floors and other large indoor areas with vibrant washes of RGB color. Designed to provide unlimited creative lighting options for entertainers, theaters and clubs, this elongated LED bar can be mounted just about anywhere — on walls, on stage trussing, or even set on the floor. The Mega TRI 60’s unsurpassed brightness, amazing flexibility and wide area coverage make it great for shining color along the length of a wall, washing an entire stage or dance floor, creating dramatic uplighting and backlighting, or even dressing up the façade of a DJ booth. The unit’s 3-in-1 RGB LEDs give lighting users the advantage of having American DJ’s powerful Tri-Color mixing technology on their side. Because each of the LED sources contains red, green and blue diodes, colors are mixed to exacting precision within each individual lamp, resulting in ultra-smooth superior color-blending without the distraction of unwanted RGB shadows. To make the color creation process even easier, the unit comes with 32 built-in color macros that can be accessed with the touch of a button. Virtually anyone — from novice DJs to experienced lighting professionals — can operate the Mega TRI 60. The fixture has 6 control modes, both manual and DMX, including: Auto, Sound Active, Static Color, RGB, Program, and DMX-512. In Auto and Sound Active modes, users can choose from 22 stunning pre-programmed lightshows with adjustable speed and fade control. Six DMX channel configurations (3, 5, 6, 8, 11 and 29 channels) are available when programming the Mega TRI 60 using a standard DMX-512 controller. An onboard four-button DMX LED display makes it a cinch to navigate through the various programs and menus. The Mega TRI 60 is also compatible with American DJ’s ADJ LED RC wireless infrared remote (sold separately), for convenient wireless control of Blackout, Program Selection, Auto Run, Strobe and other functions from distances up to 30’. Plus, with the Mega TRI 60, users get all the bonus benefits of LED lighting technology. This includes an energy-efficient low power draw (40W max), extremely long lamp life (rated at 50,000 hours) and cool running temperature. Other professional-quality features of the Mega TRI 60 include a 25-degree beam angle, variable-speed strobe effect, smooth dimming from 0–100 percent, multi-voltage operation (AC 100V–240V 50/60Hz), and flicker-free operation. Up to 20 units can be daisy-chained together via three-pin XLR cables and IEC power links. The Mega TRI 60 comes in a durable aluminum casing and includes mounting brackets for easy setup and installation. It measures 23.75"L x 3"W x 4"H (600 x 70 x 96mm) and weighs only 7 lbs. (3kg). The MSRP of the Mega TRI 60 is $349.95.